I have been designing content marketing strategy in large B2B enterprises for the last few years. 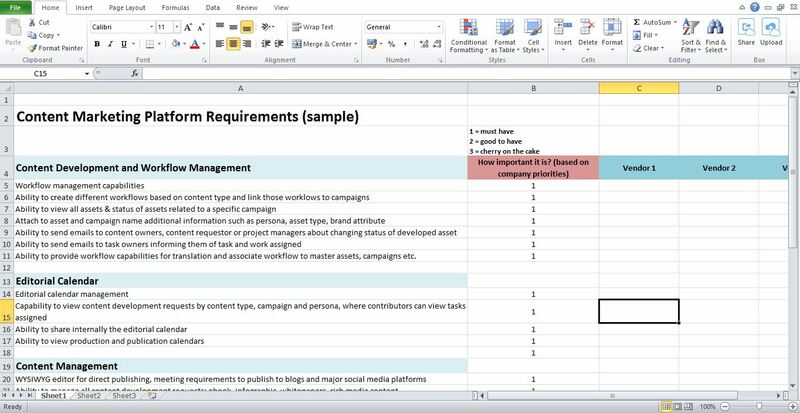 If I have to list the top challenges I have had with its implementation there is no doubt that the first was a missing Content Marketing Software Platform. Other major challenges were, in order: 1) setting up proper analytic and 2) moving our content strategy from central pilots to global deployment (see my post on NewsCred Insights). Our complex marketing technology stack, heritage of endless company acquisitions and integration, miss in fact this critical piece: we had to invest a relevant amount of time thinking at how to replace all processes and functions that a content marketing platform could offer: content creation, content curation, planning, editorial calendar, workflow management, publishing, internal and external content distribution, analytics, and last but not least, intelligence. There has been a mind-numbing proliferation of technology vendors and solutions to address the needs of content and digital marketers in the last few years. For instance, Curata’s content marketing tools map has increased from 40 to over 130 vendors in its most recent version. NewsCred too has helped navigating across the ocean of marketing technologies with one of its latest posts. Mergers and acquisitions have contributed to make things even more complex. Now, let’s go back to the basics for a moment, and let’s define what a content marketing platform is. The latest Forrester’s Wave report on Content Marketing Platforms (end of 2015) provides some clarity (note: the report has restricted access). [Definition] Content marketing platforms are solutions that help marketing teams collaborate on a content strategy, orchestrate the numerous, concurrent streams of activity by content creators, curators, and distributors inside and outside of the company, and optimize downstream cross-channel distribution to key audiences. 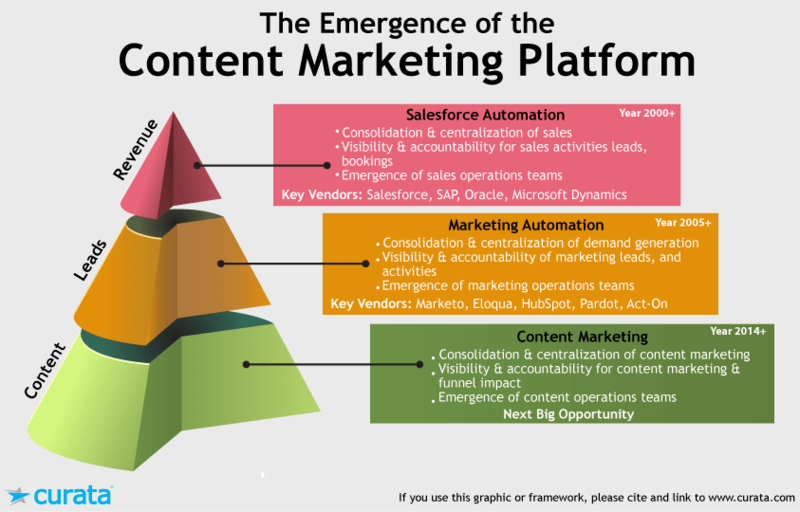 A Content Marketing Platform is this, and much more. CMPs act as a glue among several enterprise technologies managing content, distribution, analytics, pipeline (which is in general the primary goals of all B2B marketers) and insights, one of the new frontiers for such kind of software platforms. It is clear why CMPs have a central role and integrate several pieces of the marketing technology stack. Sales Force Automation platforms fuel revenue by tracking and supplying sales opportunities and leads. Marketing Automation Platforms drive Sales Force Automation by supplying marketing qualified leads. But what drives the marketing activities and leads of Marketing Automation Platforms? Content. Like a car without gas, marketing automation can’t get very far without content. Content is needed for everything from a website (which is tracked by marketing automation), to email campaigns, to even pay-per-click landing page offers. Many of today’s content marketers have little accountability and transparency in terms of how their content is performing. Their content is often warehoused and stored in multiple disparate systems and spreadsheets. That’s why a CMP is required. CMPs help marketers addressing all of them. Back to my past experience and projects, as soon as we recognized the need for a CMP for our organization, we started to list all requirements for the “perfect CMP”. We segmented the requirements in six main categories, which I list here below. Using this simple and repeatable methodology, we evaluated several vendors. Ability to provide workflow capabilities for translation and associate workflow to master assets, campaigns etc. There is not a single way to evaluate the best fit for your organization. All starts with your company/division objectives. In our case support for our content marketing strategy and in addition integration with the existing stack, support to existing internal processes and analytics were the main goals and then main criteria for selection. A few months ago I created a comprehensive post outlining an twelve-step Content Marketing strategy. That’s exactly what the implementation of a CMP will support. A CMP will definitely address and support most of the points above, and as a consequence, the overall content strategy. Pingback: Content chronicles - Vagabonding. Marketing. Tales. Pingback: Content Marketing Strategy series for large B2B and B2C enterprises - Vagabonding. Marketing. Tales.